Can you believe? : "Joyn hands with me in this work"
"Joyn hands with me in this work"
Once again I have the challenge and joy of immersing myself in words from over three and a half centuries ago, experiencing a call to discipleship from early Quakers that challenges me today. Again the assignment I got from Friends House Moscow is to help check the Russian translation of a writer included in Hidden in Plain Sight: Quaker Women's Writings 1650-1700. As with my earlier assignment (Sarah Chevers and Katharine Evans on their three-year ordeal under the Inquisition on Malta), the translator faced at least a three-fold challenge: understanding the 17th-century English correctly, whatever the individual writer's idiosyncrasies might be; adding to that the specifics of Friends spirituality as it emerged in those early years; and producing a translation in accessible Russian that preserves the voice and historical overtones of the period. ... For I can testify that unless you are ready to sink down into, and be shaped by, the things that reveal God's power and authority, you will not attain the stature of the soul that daily sinks down into the things of God. I received this testimony in the Lord's wisdom, and it lies as a heavy weight upon my spirit until I faithfully express it. ... For I can give you this testimony--a testimony given me in the Lord's wisdom that lies as a heavy weight upon my spirit until I faithfully express it: unless you are ready to sink down into, and be shaped by, the things that reveal God's power and authority, you will not attain the stature of the soul that daily sinks down into the things of God. Questions: was it right for me to take out the word "Creature" from Sarah Jones's original, supposing that she was speaking to the reader ("ye else shall fall short...") and referring to a creaturely humility that is already implied by her message? Does "wrought" equal "shaped"? (Formed?) And does "discharge" equal "faithfully express"? I have loved this exercise, because there is so much here that challenges my take-charge, problem-solving nature and stresses the lowliness of discipleship. She even cautions us not to be distracted by religious debates: "... and so, dear babes, reason not with flesh and blood, nor with the voice of the Serpent, for if you do, you will darken the council of God in your selves...." But we're also not to focus on our own weakness: "Look not at your own weakness, but look at him who is calling you in his eternal love, who will make the weak strong, and will pull down the mighty from their seat." That's my plea, too, that we can "joyn hands" with Sarah Jones and each other in this work, and together experience God-given strength to build a discipleship for today's challenges. Here's a link to the full epistle by Sarah Jones. 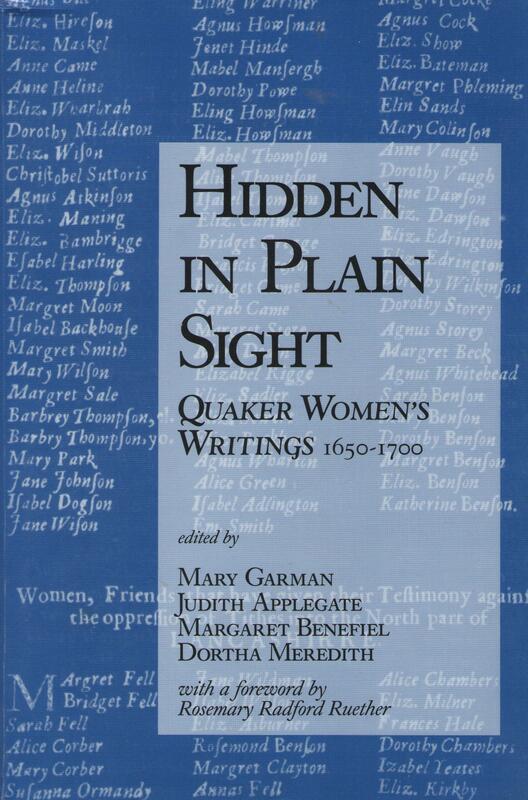 The full collection Hidden in Plain Sight: Quaker Women's Writings 1650-1700, edited by Mary Garman, Judith Applegate, Margaret Benefiel, and Dortha Meredith, was published in 1996 by Pendle Hill Publications and is available through them or through Amazon. Craig Barnett provides an example of what joining in a dialogue on behalf of Sarah Jones's work might look like today: "My own understanding is that being a Quaker involves a respect for our collective discernment, but not necessarily a submission to it." Barnett invites us to comment. The makers of the documentary Lord Save Us from Your Followers are about to release Undivided, "the unbelievable love story of a church and a public school." Two thoughtful discussions on worship: "But contemporary worship brings people to Jesus! Right?" and "Christianity Cannot Survive the Decline in Worship." ("Though both my Evangelical and Anglo-Catholic friends can testify to my skepticism of any excess in worship, I do believe that the faithful should experience worship as something extraordinary and uplifting.") Thanks to Nancy McCormick for this second link. "The Great Evangelical Break-Up," with autobiographical insights from Micah Bales. Two contrasting commentaries on a film that I haven't viewed yet: Zvyagintsev's Leviathan faces a storm of criticism, but also approval from his local bishop. "Waiting" as a form of protest. Good to see you doing this! Thank you, Marshall. I've passed your comments on to the Friend in charge of editing.